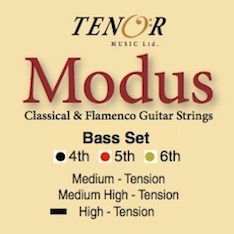 Silver plated high tension bass strings for classical or flemanco guitar. "I don't always have time to change my students strings for them. It's so much simpler to teach a novice player to use String-Tie. They learn quickly, and we're back to our lessons in no time at all."